I'm in Minneapolis for a conference and I brought Tata Harper's Jet Set Survival kit with me! The kit consists of Aromatic Irritability Treatment, Hydrating Floral Essence, and Replenishing Nutrient Complex. The Hydrating Floral Essence was my favorite product of the three. A few light sprays on my neck and face felt - not surprisingly - really refreshing after a 3.5 hour flight. The scent is light, feminine and not nearly as concentrated as the Aromatic Irritability Treatment, as you might guess. I was very curious about the Replenishing Nutrient Complex which is applied via roller. A patch test on my skin, however, produced some redness so I've been cautious about using it. If you try it for yourself, please let me know what you think! Overall, I am glad I purchased this Jet Set kit as it serves as a great (relatively) inexpensive introduction to Tata Harper's wonderful line of products. 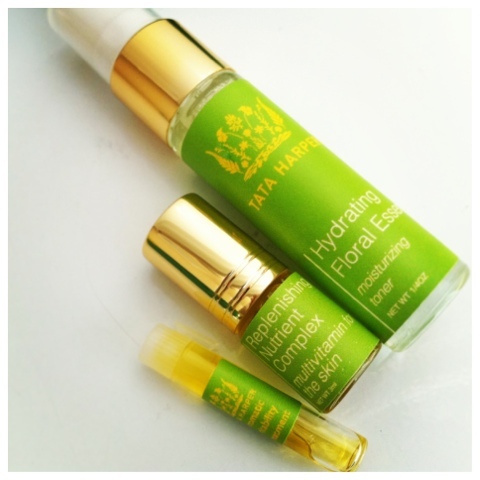 I am seriously considering buying the full-size Hydrating Floral Essence when the travel size runs out!